Speed, Excitment, and yes, a Litte Blood! Travis back with an update about some Tampa Bay entertainment that will provide exciting times for everyone! 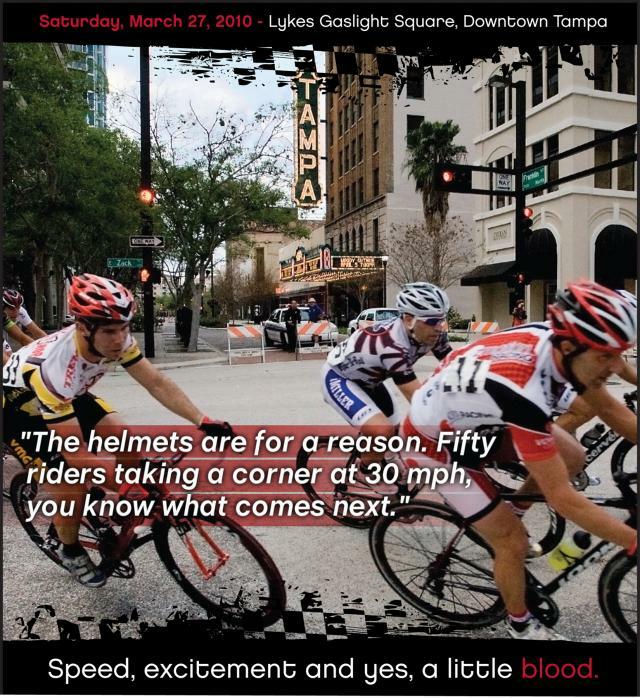 The Tampa Twighlight Criterium is returning to the streets of downtown Tampa in just a couple of weeks, and we have the details for you. A criterium, or crit, is a bike race held on a short course (usually less than 5 km), often run on closed-off city centre streets. Race length can be determined by a total time or a number of laps, in which case the number of remaining laps is calculated as the race progresses. Generally the event&apos;s duration (commonly one hour) is shorter than that of a traditional road race however, the average speed and intensity are appreciably higher. The winner is the first rider to cross the finish line without having been "lapped." bike races all day long culminating with a professional race at dusk; live music from a stage; food and beverage with a focus on local companies; kids area including a bike rodeo to teach kids safe biking skills, bounce house, climbing wall, etc. ; wellness area including fitness demonstrations, healthy cooking demos and more; exhibitors with a “green” or biking-related theme; and “Celebrity” fun races and a community cycling parade. And if you&apos;re interested, you can find the 2009 Results at Floridacycling.com. For more information about the festival www.tampacrit.com. Trust me, you&apos;ll have a great time! And keep checking back here for more great things to do in Tampa Bay.